In 2008, credit card delinquency rates in the United States hit a four-year high, according to Equifax, a credit card analysis firm. In times of economic softness, people are often tempted to use their credit cards to see them through. Here we go over some of the major advantages and drawbacks of credit cards and show you how to use yours wisely. There are plenty of great reasons to use credit cards. Credit cards eliminate the need to carry large amounts of cash, and many of them offer excellent rewards programs, enabling card users to earn airline miles, cruise ship rewards and other perks by purchasing everyday items like gasoline and groceries. Credit cards are also great in helping you build up your credit history, which can affect you in various areas. For example, your employers or landlords may check your credit history. However, make sure you avoid the disadvantages of credit cards. For example, overuse. Revolving credit makes it easy to spend beyond your means. We highly recommend you to use your credit card like your debit card. Before you slide your credit card, check your bank account to make sure you have enough money to pay your debt back. Other disadvantages are credit card agreements. Credit card agreements are notorious for their copious fine print. If you want to avoid being taken for a ride by your next credit card, be sure to have your reading glasses handy. Pay attention to these things: annual fees, late fees, interest rates, minimum payments, over-the-limit fees and bounced check fees, etc. Credit cards themselves don’t put people in debt. After all, a credit card is just a tool, and tools are only as dangerous as the people who use them. To minimize the dangers to your financial health, choose your cards wisely and think twice before using them. There are lots of places around you where you can learn personal finance. Knowing how to manage your money will be really helpful for your credit card use and even your whole life. As it gets closer to the Holiday season, it is common to begin feeling financial pressure. We all know what it feels like to pull out the winter clothes, deciding if we really need to buy a new pair of mittens, while the looming hole in the index finger is getting bigger by the day. With all the holiday celebrations and the expenses that come with them, it’s easy to understand why so many of us are having trouble sleeping at night. The stress and anxiety of financial and educational matters always seem to pile up at the end of the year and sometimes unexpected expenses can leave us wondering how we are going to pay our heating bill, let alone how we are going to fill our grumbling bellies. Everyone needs help sometimes. The best thing to do if you are ever struggling as a student, faculty, or staff member is explore resources on campus. 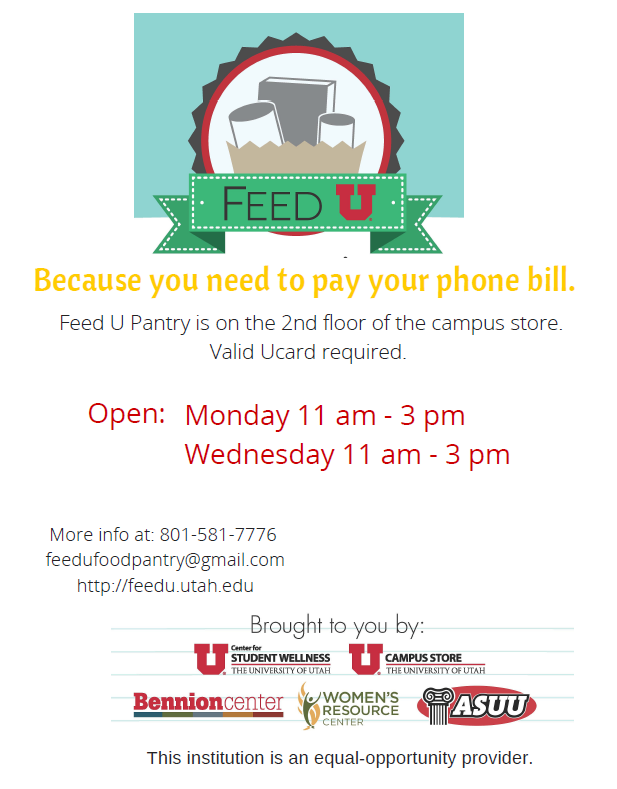 One amazing, yet underutilized resource here on campus is the Feed U Pantry. This resource provides tasty and nutritious food for students, staff, faculty, and their families, free of cost. All you need do to is bring your valid U card to the food pantry and you can receive ‘easy to make’ meals for you and your family, no questions asked (just remember your Ucard). Many students don’t know this resource exists, possibly due to the location of the pantry, or due to the discreet nature of the resource. The pantry is located on the second floor of the University Campus Store, right next to where students pick up their books for the semester. It is open on Monday and Wednesday, from 11 to 3pm. If you are worried about people knowing that you are going to the pantry, don’t be. It’s tucked away discreetly on the second floor and the staff are great and professional. Everyone has hard times, that’s why the resource is there (especially at the end of the month, before pay day). No one should have to go hungry, and the Feed U Pantry aims to make that goal a reality. Make a list Make a list of items you have had your eye on that you have been waiting to buy, or items that you would like to buy as gifts. Your kids can also make a list prior to Black Friday. If your kids give you a list before Black Friday, you will have time to comparison shop and get the best deals on items. Having a list of items you would like to purchase can also help you stay within your budget- for example, if you budget $300 to spend on Black Friday, and all of your listed items add up to $500 even with the best sales, you will have to prioritize the items that you really want to purchase, and items you are willing to wait for. Comparison shop: After you have made a list of the items you would like to purchase, write down the price as you comparison shop. When you see a better price, write down that price and where it came from. Comparison shopping can be done in many ways: online, in-store, Black Friday apps, and from Black Friday newspaper ads, etc. Always stay in budget! Black Friday is filled with temptation to spend, spend, spend. Staying within a budget will help you prioritize what you want most, and help you stay on track to reach your financial goals. Budgeting methods that can be especially helpful to use on black Friday include the cash envelope method, and checkbook register method. These two budgeting methods allow you to immediately see the effects of your purchases. If you are tempted to sign up for a store credit card, read the fine print. All credit card applications are required to have a Schumer box. This is a box that contains clearly stated information about terms of the credit card. The Annual Percentage Rate (APR), penalty APR, minimum interest charge, annual fee, and transaction fees will be listed in the Schumer box. Remember: never sign up for a credit card unless you have a plan to pay it off in full.